Gary Garritan's powerfully expressive solo violin instrument features some impressive technical innovations. Will it create a new generation of virtual Paganinis? tial Kontakt 2 version should have been superseded by a functionally identical Kontakt Player, which will also open up in Kontakt 2. When it comes to sampling orchestral instruments, Gary Garritan has a long and distinguished track record. His 1999 Gigaharp library was one of the first to take advantage of Gigastudio 's unlimited sampling time. In August 2001 Garritan's Orchestral Strings caused a stir by offering 8GB (at the time an unprecedentedly large figure) of sampled string sections. This was followed by the critically acclaimed Garritan Personal Orchestra, which endeared itself to impecunious musicians and composers everywhere by squeezing the full instrumentation of an entire symphony orchestra into a 2GB player costing less than £200 in the UK. Although something of a stylistic departure, Jazz & Big Band was no less musically effective, but now the Stradivari Solo Violin (created by Giorgio Tommasini, Stefano Lucato, and Garritan himself) sees our man resuming his lifelong love affair with orchestral stringed instruments. Someone once said that if all the people in the music business who were in it for the money were to pack up and leave, the industry would become a far healthier and downright more enjoyable place. Although he displays canny market awareness, Gary Garritan is clearly not out merely to make a buck, and his web site proves it: bristling with artistic and educational features (including over a thousand user demos, an interactive edition of Rimsky-Korsakov's Principles Of Orchestration, and a radio station featuring contributions from over 180 composers producing music using Garritan sounds), the site has a strongly supportive community feel. The most telling link is with the Drake Music Project in Edinburgh, which enables people with disabilities to play and compose music — using Stradivari, a program called E-Scape, and pressure sensors to control expression and vibrato, Rhona Smith, an 18-year-old woman with cerebral palsy, has created a moving version of Massenet's 'Meditation' (www.garritan.com/mp3/Rhona-Massenet.mp3). Like many manufacturers, Garritan is never slow to talk up his products' new features with a juicy bit of incomprehensible jargon. This time, the claim is that Stradivari uses 'real-time sound shaping' rather than 'freeze-dried samples', or if you prefer, 'morphing samples combined with instrument body resonances and intelligent performance scripts make the gestalt of these innovations something unique'. That sounds terrific, but what does it mean? In a nutshell, the idea is that rather than supplying a large number of disparate multi-sampled performance styles that have to be pasted together in a sequencer, the instrument is designed to let the player create a wide range of articulations in real time using combinations of controllers — to put it simply, you actually play the instrument as opposed to programming it. To do this in a musically effective and controlled way requires a slight learning curve, and also some adjustment of your expectations about how sampled instruments behave. I got a first-hand taste of this when I first played Stradivari: the initial pleasant surprise was that, rather than supplying the usual endless list of playing styles, the library (which contains about 520MB of mono samples) consists of just one program — from a reviewer's point of view, that was quite a relief! The next revelation was less welcome; despite approaching the instrument with the highest of artistic intentions, my first few notes sounded like Homer Simpson attempting to play the violin after an evening at Moe's Tavern. All I could muster was an unimpressive collection of short bow attacks which, unlike our cartoon hero, could only be described as unanimated. Reading the manual put me straight: as with all of Garritan's recent libraries, a MIDI controller has to be employed to activate the instrument's full sound. In the case of Stradivari, you need to use a MIDI expression/volume pedal to bring in the sustains, having first adjusted your keyboard settings so that the pedal outputs MIDI Continuous Controller number 11 (CC11), the Expression controller, rather than number seven, the more normal Volume controller. Once I'd hooked the pedal up, the violin began to come to life. Here you can see a violin phrase I played into Apple Logic, varying the amount of vibrato (green line) and the volume swells (yellow line) simultaneously using mod wheel and a footpedal. Note that I've used no vibrato on the three short notes to simulate how a violinist might negotiate this phrase.The single Stradivari program consists of a set of 10 keyswitches which select various playing modes and articulations. Keyswitch C1 activates 'mono legato' mode, which uses short bow attacks layered over the sustained notes. Note velocity determines the bow attack volume and sharpness of attack, while the level of the sustains is controlled by the footpedal. (This layering technique was first done by Denny Jaeger back in the '90s, and remains valid today: the initial bow attack covers up the relatively quiet start of the sustain sample, which in turn comes to the fore once the bow attack has subsided.) Keyswitch F1 substitutes a longer, louder downbow attack for the lighter spiccato attack used in keyswitch C1 — this heavier bowing works well at the beginning of a phrase, or for adding emphasis to a note. If you want staccato notes, you just play them that way — when you release a note, the spiccato bow attack (which uses a 'round robin' rotation of four takes) gives way to a release trigger sample of the bow bouncing off the string, creating a realistic simulation of short-note bowing. 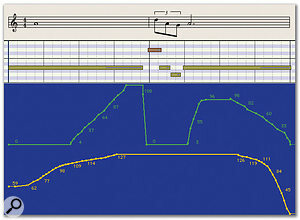 Via some clever under-the-bonnet programming, made possible by Kontakt 2 's MIDI scripting facilities, the mono legato mode temporarily switches to polyphonic mode for up to four simultaneous notes if the time interval between the notes is less than 20 milliseconds — this means that you can insert a two, three or four-note chord in a legato line without changing playing mode. However, if you need to play multiple non-synchronous pitches, you can switch the Stradivari over to polyphonic mode by selecting keyswitch D1. Stradivari packs three innovative secret weapons, which together make it sound much more realistic than your average sampled violin. The first of these affects dynamic transitions: if you hold a long note and push up the expression pedal, the instrument moves through its four dynamic layers, cross-fading between the different sustain samples from pp to ff with no trace of phasing, chorusing, layering, break in the tone, or other unwanted artifacts — the transition is as smooth as silk, and sounds exactly like a violin player exerting more bow pressure while sustaining a note. This is achieved by a new patent-pending technique called 'Harmonic Alignment', developed by Giorgio Tommasini. 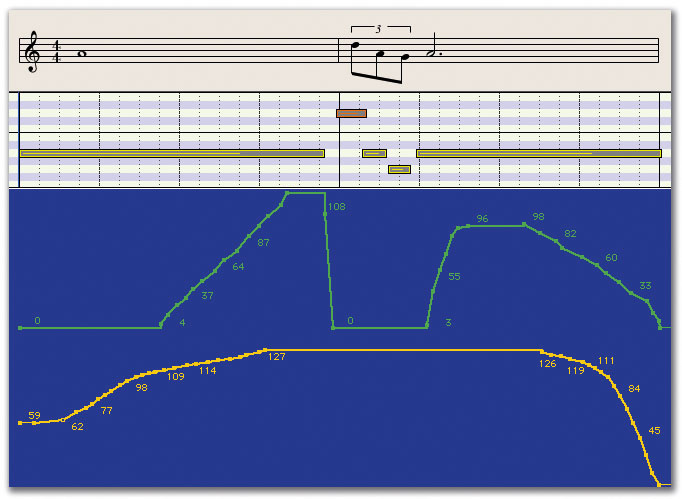 In the inventor's words: "All samples corresponding to different dynamics of the same note are processed in order to temporally match the phase of the corresponding harmonics. This results in a set of sounds timbrally indistinguishable from the original samples, which can be played simultaneously with no phase artifacts." I've no idea how it is done, and haven't come across this phase-matching idea before, but can confirm that the sonic results bear out the makers' claims. The second innovative feature concerns vibrato. Mod wheel-driven vibrato tends to produce an unpleasant pitch wobble which degenerates into a ghastly siren-like wailing when the wheel is pushed all the way up. This synthetic racket bears little resemblance to real-life vibrato, and of late some orchestral-library manufacturers have admitted as much by dispensing with it altogether. However, via some more of Tommasini's technical trickery, Stradivari 's vibrato sounds extremely lifelike. Apparently the vibrato's pitch modulation effect is created by a LFO as usual, but an additional process ('convolution with a modal impulse response') recreates the characteristic amplitude changes (also known as 'tremolo') which occur in real vibrato. Again, I'm not clear how this works, but I am happy to say that it definitely does! The default vibrato speed can be adjusted via MIDI CC67 — you can also temporarily increase the speed of the vibrato by using aftertouch, but I found this rendered the effect somewhat less lifelike. Stradivari 's third ace in the pack is its portamento (glide) effect. Unimpeded by frets, violinists often slide between notes, sometimes using small, subliminal pitch glides, but occasionally introducing a big glissando for obvious dramatic effect. Drawing on the same convolution technology devised for its vibrato (which, I'm told, introduces formant shifting on pitch changes) and some more clever MIDI scripting, the violin's portamento slides sound utterly convincing for both subtle and unsubtle types of delivery. However, making them obey your musical will is another matter, as I'll try to explain! Portamento pitch glides are automatically created between overlapping notes when Stradivari is in mono legato mode. The longest, most pronounced glissandos are created when a sustained note overlaps with a second quiet note — if the second note is played louder, a quicker portamento occurs, to the point where a ff overlapping note produces no portamento at all. This is somewhat counter-intuitive — the tendency is to try to create a big glissando by playing a loud note, rather than a quiet one — but after a little practise I began to get the hang of it. The musical effect is great, but my only criticism of this style is that the slowest glissando (from bottom note to top) lasts for no more than a second — it would have been nice to have a few samples of slower, more exaggerated glissando effects, if only for those Tom & Jerry musical-comedy moments. One downside of the built-in portamento scripting described above is that if you play very fast passages quietly in monophonic mode, there's a danger of unwanted big glides occurring if any notes should accidentally overlap. Overlaps can of course be cleaned up in a sequencer, but for live playing in mono mode I found the safest way to avoid accidental portamentos in very fast passages was to whack my keyboard's velocity scaling up to maximum and play loudly! Alternatively, you can simply play the fast passage in polyphonic mode, which has no built-in portamento effect. Using these highly expressive techniques, one can play legato melodies with or without portamento, using the expression pedal to vary the dynamics and the mod wheel to control vibrato. It is of course possible to sequence the notes first and add the expression data later, but that would be far less fun and take 10 times as long! Never one to let the grass grow under his feet, Gary Garritan is about to release a solo Gofriller Cello to accompany Stradivari Violin. A sneak preview revealed that the cello has a superbly mobile, lively sound and matches Stradivari 's levels of expressive realism. Work is also under way on a solo viola and double bass, as well as a second violin (this one made by Guarneri). Garritan has spoken about applying the same approach to other orchestral instruments — if the idea goes ahead and pricing levels remain the same, it would enable users to gradually build up collections of good-quality, expressive solo instruments one instrument at a time without breaking the bank. 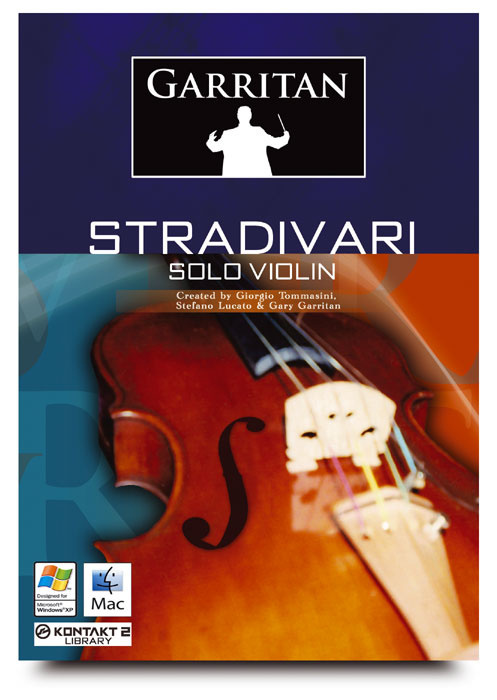 Stradivari supplies the straight, four-dynamic sustained notes and two types of bow attack described earlier in straight and con sordino (muted) versions, along with two-dynamic pizzicato samples and a set of natural (in other words non-chromatic) harmonics. The effect of the mute is quite subtle; it reduces brightness and creates a slightly more mellow sound overall, most noticeably in the violin's lower register. Being recorded in mono, the pizzicatos lack the sumptuous stereo room acoustic one hears in some string libraries, but they're perfectly adequate for plucked note passages. It's a shame that no artificial harmonics or col legno sustains were included — the natural open-string harmonics are mapped only to their real-life pitches, leaving wide chromatic gaps across the keyboard. The instrument has a few other tricks up its sleeve: its 'trills' mode lets you play trills as a violinist would, in other words holding down a note while rhythmically playing a repeated trill note. The main note is automatically muted every time the trill note sounds, and (unlike on a real violin) the trill can be played between any two notes you like. Once again, the musical effect is incredibly lifelike. This keyboard mode has interesting extra applications — by holding down a note and playing a series of fast staccato eighth notes above and below it, you can introduce an Irish or Eastern European folk violin flavour to melodies, and it's also useful for certain legato effects. Unfortunately, the tremolo mode is less effective: it outputs a kind of light double-bowing (a bit like a single repeat on a delay line) to simulate one fast back-and-forth motion of the bow, after which it's up to you to play repeated notes to prolong the tremolo effect. I found it difficult to synchronise the timing of my repeated notes to the fixed speed of the built-in bow repeat — you can overcome this difficulty to some extent by editing a sequence of repeated notes to the right length and timing, but even then the tremolo effect doesn't sound very convincing. The long note samples play for eight to 10 seconds and are unlooped, but it's possible to artificially extend their duration by using a virtual bow-change — you can do this in mono legato mode by playing a long note, pressing the sustain pedal, then playing the note again. This produces a smooth legato re-bowing, preceded by a very slight downwards pitch modulation designed to mimic the behaviour of the real instrument. I wasn't aware that re-bowing a string had any effect on its pitch, but must say that the pitch modulation is so slight that I wouldn't have noticed it had the manual not drawn it to my attention. Although smooth and fairly unobtrusive, the re-bowing will always be noticeable in a solo passage — however, if Stradivari is played in an ensemble and you pick the right moment to replay the note, it might just pass unnoticed. Pitch bend (controlled by the pitch wheel, naturally) has been set to the obligatory two semitones — I don't know whether it's possible to adjust this setting in the Kontakt Instrument version of Stradivari, as it wasn't available for review at the time of writing. On the subject of bends, it struck me that it would be great if one could bend just the lower of two held notes — this would facilitate all manner of country and folk licks and even Jan Hammer-style guitar pitch-bend simulations, which would help extend the violin's stylistic range beyond the strictly classical. Having said that, the range of demos on Garritan's web site prove that Stradivari is already pretty stylistically versatile! As you would rightly expect from a priceless, 300-year-old instrument, the Strad violin (played by Pauline Kim) has a rich, vibrant mature tone with plenty of depth and body. The bowing is smooth, assured, and free of inconsistencies right across the G2 to E6 range, resulting in a musically satisfying set of samples. When allied to Stradivari 's technical innovations and advanced programming techniques, the raw sounds are transformed into a sophisticated and intelligent instrument which somehow manages to be more than the sum of its parts. Forget all the technical stuff — the most important fact about the Stradivari violin is that it's enormous fun to play, a salutary reminder of why we all got started in the music business in the first place! As ever, a little bit of keyboard technique helps, but though it can make you sound like a virtuoso, you don't have to study for years to play it. With a little practise, your fiddling will soon rival that of the Enron directors, and unlike Nicolo Paganini (the great 19th-century violinist whose phenomenal technique gave rise to rumours of diabolical assistance), you won't have to sell your soul to the devil to cover the cost of this expressive instrument. Stradivari Solo Violin is unique in offering a truly solo solo violin — most libraries provide the instrument in a package comprising solo violin, viola, cello, and double bass. The Advanced Orchestra set created by Peter Siedlaczek in 1997 had a solo strings volume which is no longer separately available, but Dan Dean's Solo Strings is going strong in Gigastudio format. The East West/Quantum Leap Symphonic Orchestra strings volume has a solo violin in amongst its string sections — the instrument is improved in Symphonic Orchestra 's Pro XP expansion set, but that works only in conjunction with the original library and has no separate strings volume. The main contemporary alternatives to Garritan's product are Big Fish Audio's so-called London Solo Strings library and Vienna Symphonic Library's Solo Strings. The latter is available as a Horizon-series sound library and in expanded form as a Vienna Instrument. It sounds uncannily like a real violin, with highly realistic legato, vibrato, portamento, glissando, and trills. Seamless morphing between four dynamic layers enables smooth-as-silk dynamic transitions. The controller options allow very expressive and emotive violin performances. The tremolo simulation is not convincing. There are no long glissando, col legno, or artificial harmonics samples. If you're working with a modest budget and need a solo violin to add to an orchestral arrangement or to play on its own, Stradivari is the perfect solution. Although not a good bet for one-fingered programmers, it's a keyboard player's dream — it feels and sounds like a real instrument, and its expressive powers are second to none. Kontakt 2 library £129; Kontakt Instrument, £tbc. Prices include VAT.